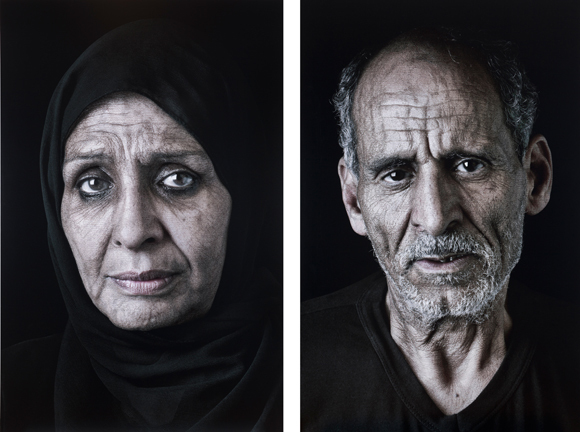 “Ghada and Sayed”, taken from the “Our House is on Fire” series, 2013. Digital C-print and ink. An exhibition of Iranian-American artist Shirin Neshat’s works at the Hirshorn Museum in Washington, DC wrapped up last month after garnering much acclaim. Running from May 18th – September 20th, 2015, the exhibit, entitled Facing History, featured a handful of Ms. Neshat’s iconic pieces in both photographic and video form and integrating snippets of Iranian history and perceptions of the Islamic world throughout. Based in New York, Ms. Neshat was born in Qazvin, Iran in 1957 and lived there until she left to the US for art school during the Iranian Revolution, settling in Los Angeles for the duration of her academic career.